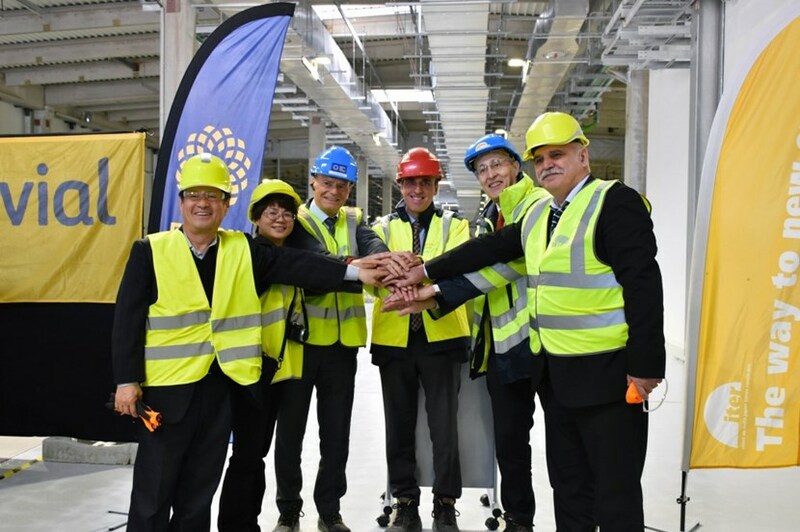 The European Domestic Agency Fusion for Energy has handed over three more buildings to the ITER Organization. ITER's Bernard Bigot (second from right) takes ownership of three buildings from Fusion for Energy (represented here by Director Johannes Schwemmer, third from left). Also present were: ITER Korea head Kijung Jung; one of the deputy heads of ITER China, Min Wang; Joaquin Garcia of the European contractor Ferrovial; and the head of ITER Russia Anatoly Krasilnikov (from left to right). The construction of the buildings and technical infrastructure of the ITER scientific installation represents Europe's single largest procurement contribution to the ITER Project—a scope covering some 39 buildings and technical areas on the construction platform. As each building is completed, the ITER Organization officially takes over responsibility and can then proceed with the installation of systems and equipment. Twin magnet power conversion buildings—for equipment converting AC power from the pulsed power switchyard to DC current for the superconducting magnets. A smaller building in the reactive power compensators area of the switchyard—for the high voltage switching equipment and control room for reactive power compensation. "The importance of these three buildings is more than just technical," said ITER Director-General Bernard Bigot during the handover ceremony. "They are strong symbols of the ITER international collaboration—the ONE ITER spirit that unites us all." Four ITER members will be supplying the equipment to be installed: China (transformers and converters for magnet power conversion plus the reactive power compensation system), Korea (transformers and converters for magnet power conversion), Russia (busbars to deliver the power to the magnets), and India (component cooling water system loops). The handover ceremony on 29 March marked the culmination of more than five years of effort by Fusion for Energy in the construction of the buildings. Equipment installation activities by the ITER Organization are scheduled to last about one year.